AN IMPROPERLY BUILT foundation can be a primary culprit of both indoor air quality and energy problems in homes. Whether your new home is built on a slab, a crawlspace or a full basement, your foundation has some very important work to do, including: prevent moisture and soil gases (such as radon) from entering the building; allow moisture to get out if it does get inside; prevent heat loss in the winter; and prevent pests from entering the home. Because the foundation is part of the “heated envelope” of the home, designing it to control moisture, minimize air leakage and minimize heat loss are just as important in the foundation as in every other part of the building. Here are some tips to help you avoid mistakes that can be both costly and difficult to fix after your home is completed. Because your foundation footing, frostwall, or basement wall is installed into the ground where it interferes with the normal sub-grade drainage, a system to remove water from under the foundation must be installed. Where possible, sub-grade perimeter drain pipes should be installed and pitched to daylight. If a sump pump is needed to pump the water from the drain pipes to above ground, install a sealedtype container for the sump pump to prevent air and soil gases from entering the building. Tip: Always place a layer of coarse aggregate material (8” thick) under a basement floor to create a capillary break and to facilitate sub-slab radon mitigation. No matter the type of foundation being constructed, a barrier must be installed to keep moisture from getting in. Concrete will absorb water like a sponge if not effectively separated from contact with the moist ground. Barriers should be used on and around all foundation concrete footings, floors and walls, as well as exposed earth/ledge areas to provide an effective isolation from moisture in the ground. Efforts should be made throughout the construction process to maintain the integrity of this barrier. This includes sealing all penetrations through the walls and floor. Tip: Options include foam insulation and/or vapor diffusion or waterproof barriers designed to eliminate contact between the concrete and the ground. Damp-proofing with black tar is only minimally effective at preventing concrete from absorbing moisture. The foundation should be completely insulated: walls and floor. The foundation is a part of the “heatedenvelope” of the house and should be treated in the same manner as all of the living space regarding heat loss. Uninsulated foundations allow warm, humid air to condense on cold, concrete surfaces, leading to mold growth and building rot. Tip: Installing rigid insulation (extruded polystyrene foam, minimum 2”) under the floor and inside or outside the walls of the foundation is a costeffective method to insulate the foundation. Tip: Consider the use of an insulated, monolithic slab. Because it is built completely at or above grade, it takes the home completely away from subgrade water. It is easy to install insulation and effective air barriers, thus reducing cost; it rarely needs any sub-grade drainage, and it’s useful for difficult sites, such as those with ledge. Because one-third of Maine homes are likely to have unacceptable levels of radon, install radon preventive features during construction of your home. Installing features during construction is cheaper: all the key features of the radon system can be installed in your new home for $500-$1000, compared to $1500 or more for a retrofit system; more effective: Installing radon preventive features during construction will make that system more effective at reducing radon in air levels to 2 or below; more energy efficient: radon preventive features installed during construction have straighter pathways, allowing for the potential that natural forces alone (without an electric fan) will keep radon levels at two or below; and part of Maine building codes. Tip: Guidance on how to build radon out of your new home is available through your local Codes official or the State Radon Section (1-800-232-0842 or 207-287-5698). Make sure the dirt slopes away from your foundation. Place a two-foot wide strip of pea-stone or non-woody mulch, with landscape cloth underneath, to discourage insect and rodent infestation and prevent vegetation from growing next to the foundation. And don’t place foundation plantings over exhaust outlets or air intakes. Ensure adequate ventilation in any space that will be occupied by people. For more information, contact the Maine Indoor Air Quality Council at www.maineindoorair.org. 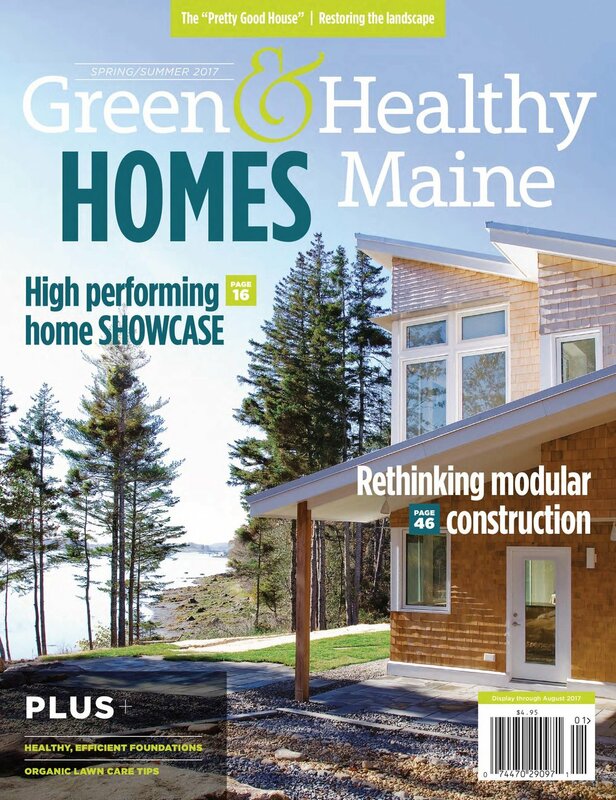 This article was reprinted from the spring 2017 issue of Green & Healthy Maine magazine. Subscribe today!